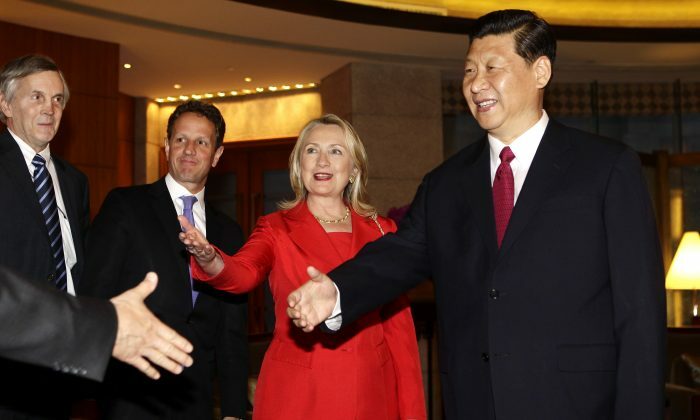 In private speeches and emails from 2013 and recently released via Wikileaks, U.S. Secretary of State and Democratic presidential candidate Hillary Clinton commended Chinese leader and Communist Party boss Xi Jinping as a marked improvement over his predecessor and “good news” for the United States, especially in regards to maintaining control over China’s military and confronting the totalitarian regime in North Korea. A few months after Xi assumed his leadership positions in late 2012, Clinton described Xi as “more sophisticated, more effective” as a public leader than Hu Jintao, the Communist Party general secretary that Xi replaced. “He’s someone who you at least have the impression is a more worldly, somewhat more experienced politician,” Clinton said, according to an email correspondence pilfered from the Gmail account of John Podesta, her presidential campaign chairman. The American politician’s attitude behind closed doors contrasts with her public stance; in 2015, when Xi gave a speech promoting women’s rights, Clinton called him “shameless” because of five Chinese women jailed for feminist activism. Clinton, who has worked in some U.S.-China diplomatic capacity for two decades, said that Xi’s ability to “assert his authority” over the Chinese military and the Communist Party was a welcome development, as were his planned economic and social reforms. “He has set forth a plan for economic reform, some of which is quite far-reaching, and some social reform as well like, you know, saying they’re going to end, at least to some extent, the one-child policy,” Clinton said. In 2015, Chinese authorities amended the three-decade-old one-child policy into a two-child policy. Clinton said that one of her “biggest concerns” between 2008 and 2012 was the ability of the People’s Liberation Army (PLA) to act “somewhat independently” and influence Chinese foreign policy. As an example, Clinton said that the PLA was cooperating with North Korea on the Kim regime’s pursuit of a nuclear arsenal, and expressed the belief that Xi Jinping’s active role in controlling the PLA would help rein in the Chinese dictatorship. “President Xi is doing much more to try to assert his authority, and I think that is also good news,” she said. Hu Jintao, who served as general secretary of the Communist Party, was in many respects an equal among six other top cadres on the Party’s Politburo Standing Committee. He was never granted the title as “core” head of the regime that previous Chinese leaders wielded over their peers, for instance, and China watchers have noted that during his time in office, it was retired Party leader Jiang Zemin who—along with a handful of proteges—held widespread influence over the regime. The PLA and state industries, as powerful and respected Party-guided institutions under the influence of Jiang, were particularly guilty of going their own way and becoming conduits for illicit business. “Hu Jintao, unlike Jiang Zemin before him, never really captured the authority over the PLA,” Clinton noted. Since Xi came to power, he has sidestepped rival politicians and factions, arrested and punished thousands of officials for corruption, including many who owed their rise to their relationships with Jiang and had carved out unofficial fiefs in the Chinese power structure. This year, hundreds of Party officials in a province that borders North Korea were sacked for corruption. Those targeted included a businesswoman accused by the American authorities of selling to the Kim regime restricted materials needed for the uranium enrichment process that is crucial to nuclear warhead production.